Business Process Modeling Notation (BPMN) is a method of illustrating business processes in the form of a diagram. 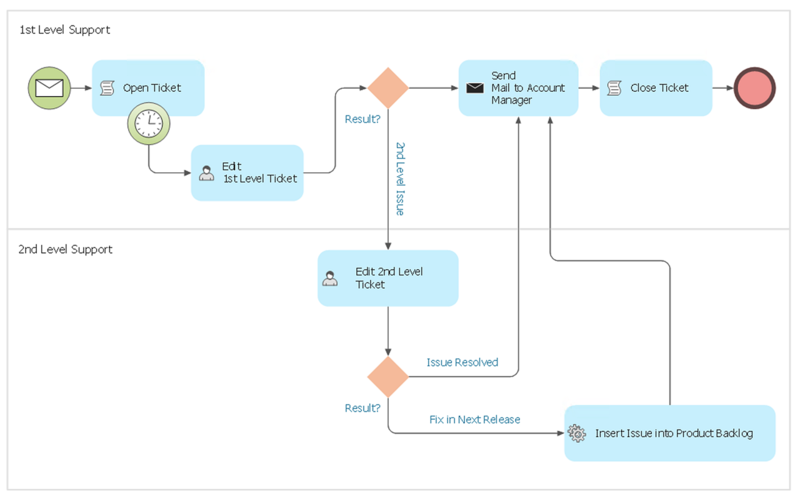 A diagram in BPMN is assembled from a small set of core elements, making it easy for technical and non-technical observers to understand the processes involved. The Events (expressed as circles) indicate when some event occurs at the start, end or during a process. Events that occur during an activity is known as a Border Event. For example, you may be assigned a task with a deadline. The deadline would be shown as a timed event on a human task activity. The ability to design business process diagrams is contained in the Business Process Diagram solution. This solution extends ConceptDraw DIAGRAM with 16 libraries that contain 230 vector objects from BPMN 1.2 and BPMN 2.0 that can be used when representing any business processes. Select the Business Process Diagram item in the Solutions panel. Choose the necessary library and click it to open in the Library panel. Add BPMN Start element to the diagram by dragging them from the library to the document page. Add the Task object by clicking on its icon from the Rapid Draw arrows that pop up when you bring the mouse cursor over the object. Select the Task object and choose the Timer Event icon from Rapid Draw tools. It is this object is the required Border Event as it is located on the boundary of the object Task. Modify objects using their Action button menu. To open the menu select an object and click the arrow button in the upper right corner of the object. Using RapidDraw tool and the Action button complete the Business Process Diagram creation. Result: The RapidDraw interface removes the laborious and time intensive aspects of business process modeling and gives all BPMN users the ability to focus on their objectives.